Choosing an organization is one of the most important steps when fostering. A well established, reputable rescue organization will have the funds to pay veterinary bills, volunteers to assist in transport, the ability to properly screen adoption applications, and to handle any issues that arise during your time as foster home. Transparency & accessible information: A reputable rescue organization will be transparent. They will openly disclose the amount of funds raised and how those funds are used. They will share the stories of how pigs were rescued, where they came from, how they are adjusting in the rescue, when they are placed for adoption, and with photos throughout the process. They allow visitors or show pictures of the living quarters of the pigs, which should be spacious, clean, and enriching. They will answer all questions asked, including how many pigs they rescue per year, how many pigs they adopt out each year, their procedures for spays and neuters, how they determine which pigs will join their rescue, what criteria they screen adoptive homes for, if pigs are euthanized & the reason, if pigs are unadoptable & the reason, the routine medical care each pig gets, how many pigs are cared for on site, the contact information for their veterinarian(s), as well as any other relevant questions. Does the organization have a screening process for volunteers and foster homes? If they do not screen you, they are not screening other families. You cannot expect every adoption applicant to be honest and forthright. There will invariably be homes that would be detrimental to the pig’s welfare. If screening is not done to filter through these homes, then pigs are not ensured a life of happiness and comfort after adoption. Are you comfortable assisting in a rescue effort without assurance the pig will be well cared for long term? Typical screening procedures include an application, a phone interview, references from friends and veterinarians, and a home visit. Does the organization require signed contracts to secure fosters and adoptions? These contacts protect the pigs. They often outline the care that is expected for the pig’s welfare as well as a return policy — requiring the family to return the pig to the rescue if they are no longer able to keep him. This keeps the pigs out of shelters, prevents abandonment or negligence, and keeps them from being sold on Craigslist or rehomed without proper screening. If the organization does not require signed contracts they have no legal ground to protect the pigs they rescued. Read all available contracts thoroughly even if they are not applicable at this time. Common contracts are for volunteers, fosters, and adopters. Read and understand all details. Ensure you agree with the expectations, requirements and procedures. Each organization will operate differently. You’ll want to find one that has similar goals and ideals to your own. The majority of pigs rescued should be available for adoption. 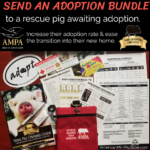 The rescue should put great effort into promoting these adoptable pigs and seeking proper homes for adoption. All pigs should be spayed or neutered before adoption. They should go to their new family with a signed adoption contract that includes a return policy requiring the family to return the pig to the rescue if they are no longer able to keep him. The pigs should be medically cleared by a veterinarian. All adopters should be thoroughly screened prior to placement. Not all rescues are 501c3 nonprofit. There are some great rescues that are registered through their state as not for profit, rather than the federal designation of 501c3. However, there is considerable cost and time involved in acquiring 501c3 status. Rescue organizations that have achieved this goal have shown strength, organization, responsible practices, perseverance, teamwork, and resourcefulness. A 501c3 organization will have a board of directors that oversee the organization’s activities and budget. They will typically have outlined operating procedures to guide you in your fostering endeavors. All donations to a 501c3 organization are tax deductible. This includes direct donations, donations of time, mileage on your vehicle, gas expenses, supplies for your foster, food, fencing, toys, pig housing, bedding, hay, cleaning supplies, crates, and any other out of pocket expenses. Many volunteers have fostered for individuals or small rescues that have struggled or refused to reimburse for medical or other expenses as promised. Often, the foster home has no recourse for non payment. Fostering for a reputable 501c3 organization will give you peace of mind that your donations are being used appropriately and that the foster pig’s bills will be paid promptly. Check the organization’s website or ask how long they have been in operation. A newer rescue will invariably have a learning curve. You may want to be part of an up and coming organization and watch it grow. On the other hand, you may be looking for a more established rescue that has ironed out any conflict or discrepancies while providing excellent protection and assurances for the rescued pigs. A reputable rescue organization will focus on education and outreach. They will offer this as direct support to adopters to ensure long term success of pigs in their homes. They will also emphasize education and outreach to the general public. Rescue organizations are overburdened by abandoned and neglected pigs. They want all the pigs in their community to succeed in their homes. They want owners to be educated and have the support they need to keep their pig happy and healthy. Through education and outreach they can prevent the need for many rescues and rehomes. In the world of rescue, reputations are invaluable. Ask around. Ask friends, ask strangers, ask in Facebook groups. Ask for personal experiences with a particular rescue before deciding where you will dedicate your time. Particularly, you’ll want to ensure they are following laws, following good animal welfare practices, treating their volunteers with respect, following through on commitments, adoptions have gone smooth, and have a good reputation overall. Beyond their overall reputation, a responsible rescue organization is built by a number of dedicated volunteers. These volunteers are the heart of rescue and should be treated with the respect and appreciation they deserve. Reputable rescue organizations will have clear guidelines of what is expected of the volunteers as well as the support and assistance available to them. Volunteers & adopters should be proud to be associated with this organization, posting photos and stories on the rescue’s social media pages. As with any screening process, when you are screening rescue organizations to adopt, foster, volunteer, or donate to, focus on getting as much information as possible for an overall picture. Use your best judgement and do not hesitate to keep looking. There are many rescue organizations and they are not created equally. By supporting a less than ethical or less than responsible rescue organization you are furthering the substandard care of the pigs in their rescue and allowing them to take on more innocent animals. When it comes to rescuing, do not compromise ethics, morals, or care standards. No matter how dire or desperate the situation, these animals deserve the same level of care and treatment that our own pets receive. If an organization or rescue is not able to provide that level of care, then they should focus on the pigs already in their hands. Overburdened rescues and hoarders/collectors are no friend to a pig in need. Together, with a responsible rescue organization, you can make a difference!